The Lucerne Reserve is an area encompassing about 50 acres of monoculture lucerne, with grass and weeds, and an upper area of predominantly native pasture. Most of the fences shown on the map are no longer there-I took them down last year to allow free access from the sheltered hill area (native) to the lush feed of the lucerne flat. My plan is to give the flock the morning in the lucerne, then head up the hill into the native pasture for the afternoon. I'm planning mid-day rest at the top of the hilly bit, where there is a water point, and an area they like to use for rest and rumination. Then down into the lucerne in the afternoon, to head back to the Racecourse Grazing Area. END OF DAY NOTES: Circuit didn't go to the letter of the plan, but certainly did to the spirit of it. An hour or so in the lucerne for morning tea, lunch on the native pasture up the hill, afternoon tea back on the lucerne. 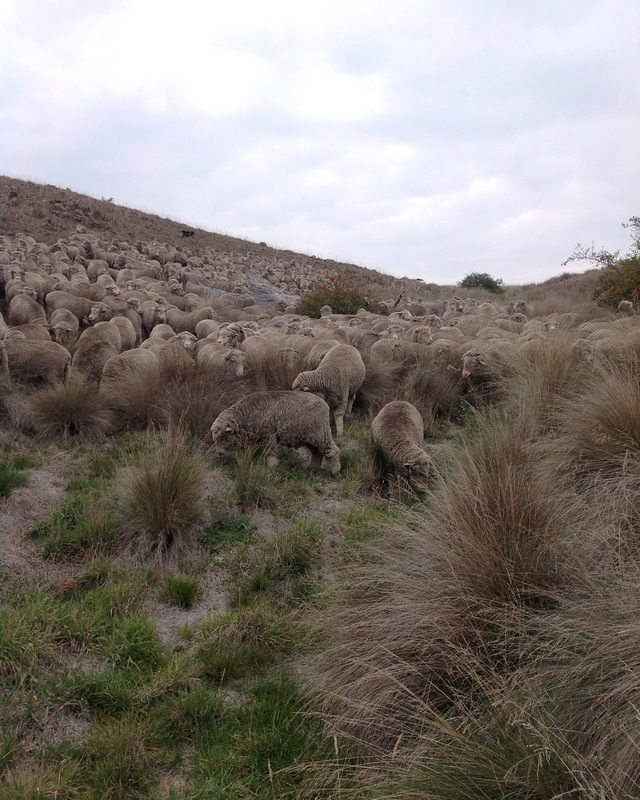 The alpine French shepherds work hard to ensure their flocks get appetising meals in the "right" order--that is, to maximise the total intake of forage--sweet and fine as well as older and coarser. After a meal of lucerne, for instance, which is a bit like steak, the lighter but more interesting native pasture seems to be just what the waiter ordered. After mid-day rest and a few more bites of natives, they were ready for some more lucerne. The other thing I saw today clearly for the first time was Horatio's determination to lead--independent of me. At what I thought was mid-day rest, he did not, and led the flock all the way to the southern, uphill boundary of the area, before finally being persuaded that I was not going to open a gate for him. So, it's watch this space. The flock is definitely missing the guidance of Old Leader. P3: ...and a few minutes later into the lucerne. P4: Headed to the first water trough. Although it's not the plan, I'm pleased we're going this direction in this part of the paddock and early in the day. Some of the best feed is here and in the afternoon we tend to rush through it. Hopefully they'll take their time this morning. P5: Alice on the right, having a drink. She stared me and the dogs down, daring us to push her away from the trough. Actually, the dogs and I turned around and walked the other way to take any sense of pressure off of Alice. She had a nice long drink. 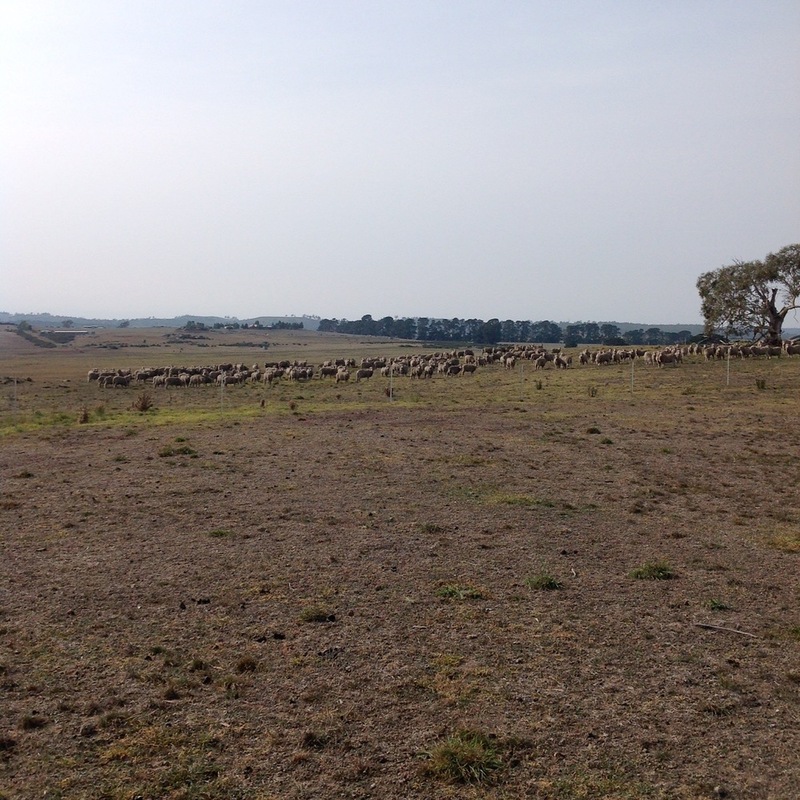 P6: Crossing the old fence line into the native pasture. Note the thistles on the old line. All of this was in the January fire. 7: native speargrass (austrostipa nodosa, though it may have a new scientific name...) gone to seed. Given the tough season, I'm ridiculously proud of this stand. Further evidence of the resilience of native ecosystems. P8: Browsing a briar rose in the gully. Nearly to the mid-day rest and water site. 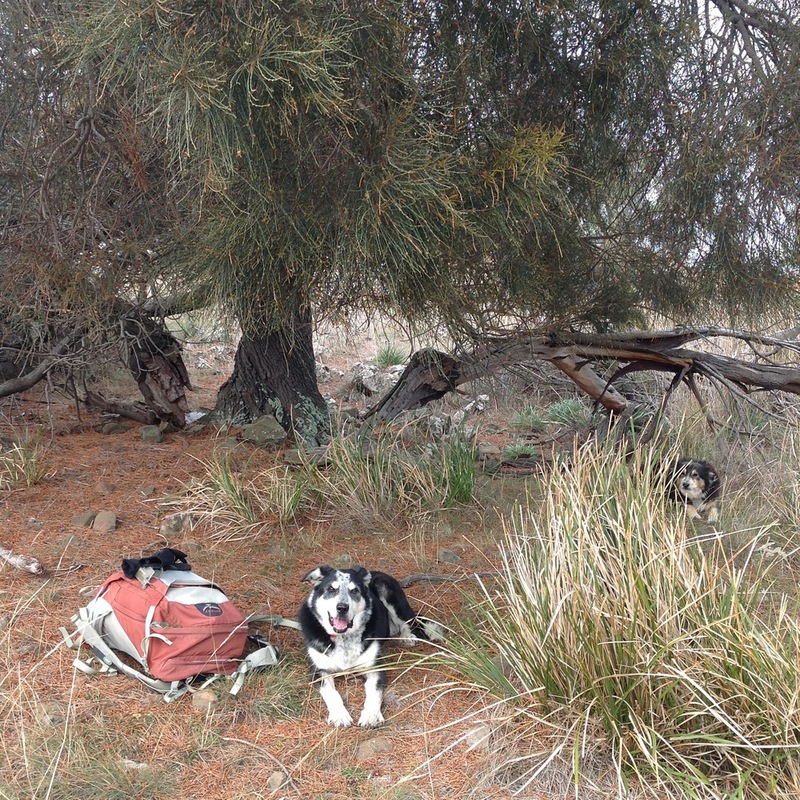 P10: My favourite rest spot, under a gnarled she-oak (casuarina). I'll try to hunker down out of the wind. I did put in an extra jacket this morning, but didn't imagine I'd want it! P11: The flock finally settled about 12:45. Now it's 2 and I'm ready to go, but as usual, they aren't. I'll start sneaking around the downwind side (south) to be ready head back when the sheep decide to move. A family of fairy wrens came to visit my she-oak while I was dozing. What a treat! P12: Horatio in the middle, lying down. Not ready to move yet. H is going to be the new flock leader, I'm pretty sure--so it would help right now if he'd get up and saunter to the front! 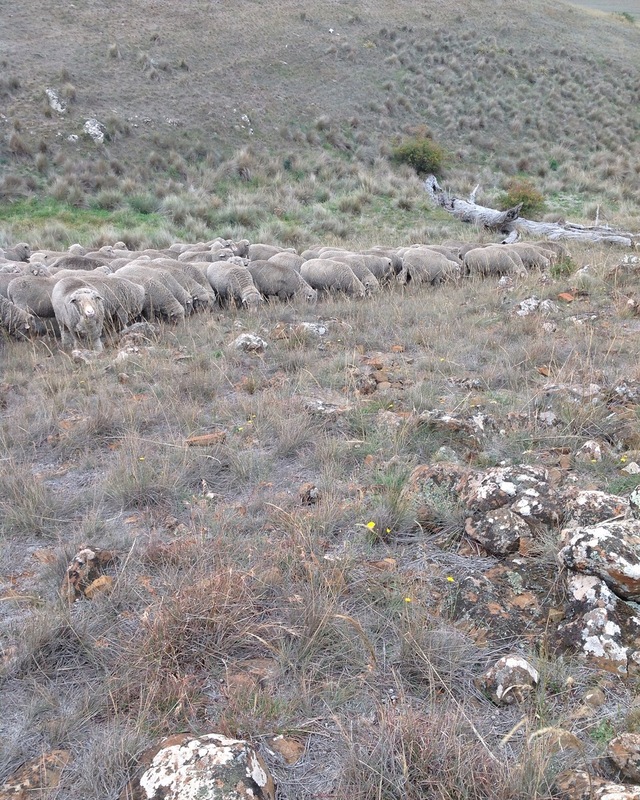 P13: Trying to work them into this ungrazed gully. Tricky because it's downhill and quite narrow and steep at the bottom. P14: Ta-da! In the gully! They had a surprisingly good graze down in the gully and up either side. P15: Back into the lucerne, with alacrity! They grazed well, but I have to confess to hurrying them along a bit, since it was getting late in the day. P16: Ooops. Nearly forgot the final shot. You can just see the mob heading back into the Racecourse Grazing Area.